Looking for a wedding band? 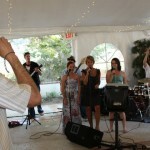 How about live band karaoke for your special day? 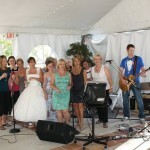 Your guests will never forget when Grandma takes the stage with a live band at your wedding reception. Or how about Uncle Randy, who has a few too many before his best Bon Jovi impression? Let us help you make your day one to remember! But don’t take our word for it – here’s a great Yelp review from Tom and Kristen, the most recent wedding we played at a beautiful winery in San Diego county. Lemme tell ya- it was about 80% their fault that the guest reviews of the wedding were exclusively: “BEST WEDDING EVER!” I am a discerning karaoker, and I HIGHLY recommend singing with them wherever they are playing- or hiring them for your event. Remember that we do a lot more than just karaoke. In fact, we can put together a wedding package that works for you. 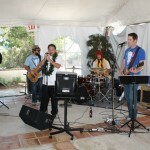 We can DJ/Emcee the whole event, provide dinner/acoustic music, music during the ceremony, reception cover band, and of course, live band karaoke. 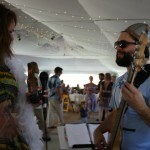 If your wedding day isn’t the right time, how about the rehearsal dinner? Those can get a little rowdy – and we can help! Rock Out Karaoke is San Diego’s most dynamic live music performance group, combining the raw power of a live rock band with the fun of audience participation, where individual singers take center stage with the live band! Complete with lyrics displayed on a monitor in real-time with the music, nothing is missing from this unique karaoke show! 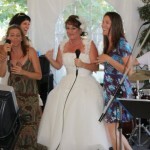 Rock Out Karaoke is available for your San Diego wedding or special event. Contact us today to find out how we can make your party one to remember!